Here are some common questions that we get from dog and cat owners in New York. Anything underlined leads to a clickable link with more details. *If this is an emergency please call us directly or contact one of the emergency pet care centers listed below. The information below and on this is intended for general information purposes only. 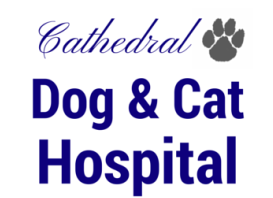 While we endeavor to keep the information up to date and accurate, Cathedral Dog and Cat Hospital is not responsible for, and expressly disclaims all liability for, damages of any kind arising out of use, reference to, or reliance on any information contained within the site. Any reliance you place on such information is therefore strictly at your own risk. While the information contained within the site is periodically updated, no guarantee is given that the information provided in this Web site is correct, complete, and up-to-date. While our website does include links providing direct access to other Internet resources, including Web sites, Cathedral Dog and Cat hospital is not responsible for the accuracy or content of information contained in these sites. The inclusion of any links does not imply a recommendation or endorse the views or ads within them. If you believe that your pet is unwell, please contact us or bring your pets to a trusted veterinarian for medical care. The New York Times just published an article about the potential risks of grain-free dog food. What are your thoughts on this? According to the below article by the NY Times, there may be a link between grain free dog food and heart disease. Most dogs do not have to be on a grain free diet unless they have a specific allergy to grains. In addition, we do not know the long-term effects of grain free dog foods. We do not recommend that dogs be fed a grain free diet unless there is a specific need for it. What type of pet food do you recommend for dogs? Dogs are omnivores and generally only need about 25%of protein in their diet on a dry matter basis. Wet or dry food are both acceptable diets for your dogs. There are a large range of pet food options out there with many new fad diets appearing for pets. We do not recommend any single brand, but suggest that you choose a reputable brand that has been on the market for a substantial amount of time. What type of pet food do you recommend for cats? Cats are carnivores and require more protein compared to dogs. Dry cat food tends to be heavier on starch so it's good to supplement a dry food diet with wet foods, especially with some of the more common brands. It's also good to avoid a diet that is made completely of fish due to the high mercury levels but many cats are so addicted to this that they will not eat anything else. We do not recommend any single brand, but suggest that you choose a reputable brand that has been on the market for a substantial amount of time. What type of pet insurance should I get for my dog or cat? There are many insurance companies that provide suitable plans depending on your needs. Before you choose an insurance, make sure you ask for their policy on pre-existing conditions as well as looking up their reviews regarding their customer service. Watch this Policy Genius video for a general explanation of how pet insurance works. What are your pet care and vaccination recommendations for my dog/cat. All of our pet care recommendations for puppies and kittens are under our services page under healthy recommendations for dogs. Our healthy recommendations for cats page is coming soon! In the meantime, please call us at (212) 864 3631 to learn more. 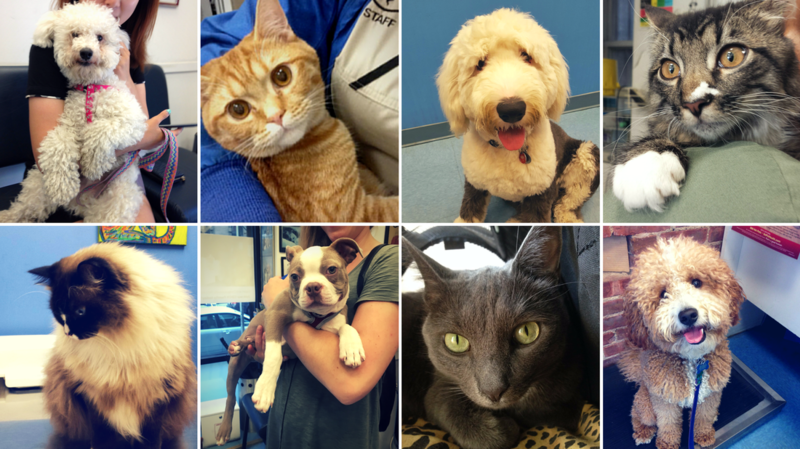 Where can I go for emergency pet care in New York City if you are not open? They are located at 510 East 62 Street, New York, NY 10065, between York Avenue and the FDR Drive. (212) 838-8100. They are located at 410 West 55 Street, New York, NY 10019, between Ninth and Tenth Avenues. (212) 767-0099. BluePearl Specialty and Emergency Pet Hospital. They are located at 1 West 15 St New York, NY 10014, between Fifth and Sixth Avenues. (212) 924-3311. It's possible that your dog or cat may be in need of a dental cleaning, especially if it has been about 2 years since the last cleaning or if your pets teeth have never been cleaned before. Dental issues are extremely common in both dogs and cats. If left untreated can be very uncomfortable and painful for pets. Eventually, they may also lead to serious health problems such as heart disease and a shortened life span. To schedule a an appointment to determine if your pet needs a dental cleaning, or to schedule a dental cleaning for your dog or cat, give us a call at (212) 864 3631, or request one online through our make an appointment page. if you believe the cause of the diarrhea to be a general upset stomach and your dog or cat is otherwise acting normally, one recommendation we may make is to withhold food for 24 hours. However, if it does not improve after 24 hours of fasting, if your pet is dehydrated, lethargic, or if you believe it to be something more serious please schedule an appointment with us. You can give us a call at (212) 864 3631 or request one online through our make an appointment page. My dog or cat is itching and scratching all the time. What should I do? There are 6 common reasons a dog or cat may be scratching all the time. The cause could be environmental, nutritional, parasitic, allergic, neurogenic, or infectious. A veterinarian can help determine what the cause of the itching is and help develop the appropriate treatment plan for this itching. If you would like to set up an appointment, please give us a call at (212) 864 3631, or request one online through our make an appointment page. My dog or cat has a strange lump. What should I do? Lumps in pets are not uncommon and can be something benign such as a lipoma or a cyst, or could be a tumor. To determine exactly what it is, a veterinarian will need to take a look at it and decide what to do with it. For a more detailed overview on lumps on bumps, Pet MD has an excellent article on Lumps, Bumps, and Cysts. My dog or cat ate something off the street/ chocolate/ a wild mushroom/ a strange plant/ something potentially poisonous. What should I do? If you think your pet has ingested a potentially problematic substance, call us, or a veterinarian you trust, immediately. If we are closed you can also contact one of the emergency clinics listed under the question regarding emergency pet care, or contact the ASPCA's animal poison control center. ASPCA has a comprehensive list of plants that are toxic to dogs and a separate list for plants that are toxic cats. You can always look through this list to see if the plant ingested is toxic to your pets. Does my dog need to have a license in New York City? Yes, a dog license is required by law in New York City. You can apply for one online, or by mail. For details on how to do this, visit the NYC.GOV website at this link: dog licenses in New York City. We recommend the Animal Care and Control, the ASPCA, Bideawee, and the Humane Society of NY. We offer a 10% discount on your first visit for pets adopted from these locations. You can also look to other local animal rescue agencies that have had a reputable history. I have found an abandoned dog or cat in New York City. What should I do? Be careful when approaching a lost pet. Do not try to grab them if they are exhibiting signs of aggression. Please contact Animal Care and Control on how to proceed, they may direct you to bring the animal to one of their Care Centers. I have found a baby or injured wild bird/squirrel/ animal in New York City. What should I do? Baby birds that are learning to fly may fall down occasionally and if uninjured, should be left alone or moved to be near a tree away from general foot traffic. This way the mother will be able to find the bird and continue to feed it while it learns to fly. The NY Audobon center has more details on exactly what to do if you find a young or injured bird. Animal Care and Control (AC&C) also accepts pigeons, gulls, starlings, sparrows, and squirrels at any of it's facilities. For further information and a list of wildlife rehabilitators in New York City, please call 311. If you have any other questions that are not answered here, please call us at (212) 864- 3631 or email us at cathedralvet@gmail.com. You can also fill out the form below, and we will get back to you as soon as we can. We will get back to you in 24 to 48 hours. If this is an urgent matter please call us directly or contact one of the emergency centers listed above.